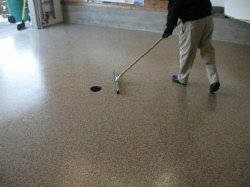 Garage Floor Drain - What Type Of Concrete Floor Drain Should You Use? Installing a garage floor drain is a convenient way of controlling any water that drips off your car and onto the concrete floor. A garage drain is also great for rinsing and cleaning the garage floor so all the dirty water doesn't end up on the driveway. When the concrete floor is pitched to a floor drain all the water runs into the drain keeping the floor dry. Without a drain, water just puddles and sits on the floor until it evaporates or is wiped up. Pitching or sloping the entire garage floor from back to front so water runs out the door and onto the driveway is your other option. A concrete floor drain is really quite simple to install, your first step is to decide what kind of floor drain you want. Trench drains are really nice. They come in sections that can be connected to each other. These sections can be 18 inches long or 10 feet long depending on what brand you buy. You could install a small section in the center of your garage or connect enough pieces to run the entire length of your garage. I've installed a lot of trench drains and special care needs to be taken to insure they don't move when the concrete floor is poured around them. If you follow the directions carefully you should be just fine. Trench drains are a lot more expensive than a simple square floor drain and will take longer to install, but they are really nice for controlling any water that gets on the garage floor. I would buy one that is made from polymer concrete and has a galvanized grate for the top. I would also only buy one that has the pitch already built into the drain, these are easier to install than the shallow to deep trench drains. 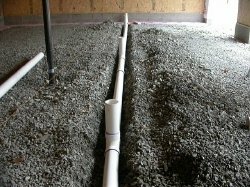 If a trench drain is installed correctly and the concrete floor has the proper pitch to the drain, you should never have any water issues in your garage. A square garage floor drain (these also come round) is a simple, very easy to install floor drain. We install twice as many of these concrete floor drains versus the trench drains. They are very inexpensive and much faster & easier to put in place. Bell trap drains come in 6, 8, and 12 inch square or round shapes. 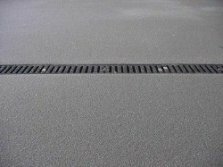 The PVC drains are durable enough for any residential garage floor, a steel one might be a better choice for a commercial garage. You could install one in the center of the garage floor or put one in the center of each garage bay. If the concrete floor has enough slope towards the drain, a bell trap drain will easily remove any water that gets on the garage floor. How much does it cost to install a floor drain? A 9 inch bell trap drain cost about 20.00 dollars. A 4" by 10 foot long drain pipe cost about 11.00 dollars at Lowe's. Depending on what lengths you need and any miscellaneous elbows or Tee fittings, not very much for this drainage system. Trench drains are quite a bit more expensive. Most of them come in sections of about 3 feet long. They can range in price from 10 dollars per lineal foot for the plastic / polypropylene ones to 10 - 30 dollars per ft. (and sometimes more) for the polymer ones. There's many choices for trench drains. They come in different depths and widths. The type of grate you choose will also impact the cost per ft.
Should I install the floor drain or hire a professional? Installing either of these garage floor drains takes a little pre-planning. Where and how the drain pipe will exit the garage is very important. If you're installing concrete walls to build the garage on, you will have to have some kind of hole in the wall for the pipe to go through. Digging the trench, installing the drain pipe, and setting the bell trap floor drain or the trench drain are all things you can do yourself. It is physical work and getting all the pitches right involves some attention to detail. I like to pitch the concrete floor at least 1/8 inch per foot towards the drain from the farthest corner when I install the concrete floor. Most all towns and cities have their own building codes. If you're building a new garage, check with your local code enforcement officer to make sure you install the floor drain according to his/her guidelines. Some cities and towns require a special filtration or catch basin oil separator system to filter the water coming out the end of the drainage pipe, especially if any oil dripping from a vehicle is mixed with the water. They're also going to want to check the drainage pipe before you bury it to make sure it has the proper pitch. If you're building a new garage and have an excavating contractor or a plumber already working there, it might be easier just to let them install the garage floor drains, they already have all the equipment and experience to do it correctly. Hiring a professional concrete floor contractor, one with good references, should insure the concrete floor slopes to the floor drain. Having a puddle of water sit right next to the floor drain is very frustrating and difficult to fix. Feel free to contact me if you have any questions about concrete floor drains or installing the floor drains, I will do my best to answer your questions. 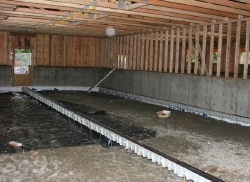 Here's a very good garage floor trench drain you can buy on Amazon.com. Disclaimer: I am an affiliate of Amazon. If you click through to Amazon and purchase a floor drain, I will make a small commission. Thank you!